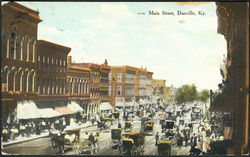 While Danville was chartered as a town by the Virginia legislature in 1787, it was not incorporated until 1836, after the Kentucky territory had become its own state. By 1860, almost 5,000 people lived in Danville, which was the seat of Boyle County. Among these was M. Levinson, who owned a clothing store in town. But Danville was nearly destroyed in a huge fire in February, 1860, as 64 businesses, churches, and houses were lost. The fire, along with the turmoil of the Civil War, during which the city was occupied by both Union and Confederate troops at various times, led to a sharp decrease in Danville’s population. Only 2,500 people lived in the town by 1870; M. Levinson was not among them. That same year, the Cincinnati, New Orleans & Texas Pacific Railroad built tracks into Danville, linking the town into a national trading network. With the coming of the railroad, Danville began to develop economically. The Jewish presence in Danville, Kentucky, stretches back to the antebellum era, though an organized Jewish community didn’t begin until the mid-20th century and lasted just a few years. During the 1870s, a small number of Jews settled in Danville. According to one estimate, 20 Jews lived in the town by 1878. By 1877, Louis Cohn and Henry Jacobs owned a clothing store together in Danville. While Jacobs was a Prussian immigrant, Cohn had been born in New Jersey. Both men had left Danville by 1900. During this era, a small handful of Jews owned stores in Danville, but did not set down roots or work to establish any formal Jewish community. According to Robert Griffin’s history of the town, in the early years of the 20th century, “the homogeneity of Danville’s religious past was broken as the Jewish community expanded and brought its special celebrations and holidays to public attention.” By 1908, five Jewish families lived in Danville. One owned a steam laundry, another was a produce dealer, two owned clothing stores, while the last was a peddler. Most notably, brothers Harry and Hyman Pushin moved to Danville soon after the turn of the century, opening the Hub Department Store in 1906. The Pushins were natives of Vilna, Lithuania, but had come over to the U.S. as young boys in the 1880s. Hyman had owned a store in Bowling Green, Kentucky in 1900 before moving to Danville. The Hub was quickly successful and the Pushins built a new larger store that cost $40,000 at the corner of Third and Main Streets in 1914. The brothers became leaders of the local business community, forming a real estate and construction company with two non-Jewish partners. 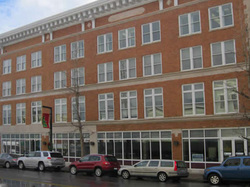 When the city’s grand Gilcher Hotel burned down in 1914, the Pushins and their partners founded the Danville Hotel Company, which rebuilt the downtown landmark right next to the Hub Department Store. While the Pushins did not remain in Danville very long—Hyman lived in Atlantic City, New Jersey in 1920 while Harry moved to Cincinnati in 1923—they maintained many of their business interests in town. Several other Jews were affiliated with the Hub over the years. Harry Zimmerman was the general manager of the store before he bought the lease to operate the new Gilcher Hotel. Jacob Baer, whose sisters had married the Pushin brothers, moved to Danville in 1913 to work in the store. By 1918, Baer managed the Hub’s clothing department. After the Pushins left Danville, Baer ran the entire store. His brother, Bernard Baer, worked in the store after he moved to Danville in 1937. By the 1930s, brothers Joseph and Walter Frankel had joined the business, and later bought it outright. By 1948, the store was called Hub-Frankel. Edward Kahn, a Russian immigrant who had come to the U.S. in 1901, lived in Danville by 1909, working as a watch repairer. By 1916, Kahn owned a jewelry store in town. The E.H. Kahn Jewelry Store remained in business for many decades, with Edward’s son Harold later taking over the business. By 1937, only about 25 Jews lived in Danville, but their stores dominated downtown. 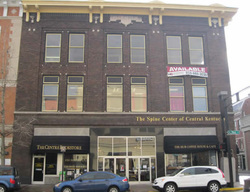 In addition to the Hub and the Kahn Jewelry Store, these included: Siegel’s Bargain Store, owed by William Siegel; the Louisville Store, run by George Shapira; Raymond Miller’s Cinderella Dress Shop; the Milady Shop, owned by Benjamin Weitz; and the Globe Shoe Store, run by Sam and Herman Routenberg. The Louisville Store was an area department store chain owned the five Shapira brothers. While George ran the Danville store, his brother David ran the one in nearby Harrodsburg. At their peak, the brothers owned about 13 stores in central Kentucky. When George Shapira moved to Louisville around 1950, he hired Ben Baer to manage the store in Danville. In the 1940s, the small Jewish community of Danville established the city’s first Jewish organization, the Blue Grass Judean Society. While the precise year of the society’s founding is unclear, they first began to bring in student rabbis from Hebrew Union College in Cincinnati in 1946. That year, George Shapira was president of the group, while Raymond Miller was vice-president and Sam Routenberg was secretary. The congregation met in a second-floor room above Shapira’s Louisville Store, outfitted as a sanctuary with an eternal light, ark (and presumably a Torah), and prayer books. Their worship style was Reform, using the Union Prayer Book and a piano during Friday night services, though some members were more traditional. Shapira kept his store closed for two days on Rosh Hashanah, and student rabbis were requested to wear head coverings and tallit while leading services. The group never joined the Reform Union of American Hebrew Congregations. With such a small congregation, the members had to be flexible and compromise on such questions of Jewish ritual. Interestingly, the Blue Grass Judean Society did not hold High Holiday services. Danville Jews would travel the 35 miles north to Lexington for Rosh Hashanah and Yom Kippur. 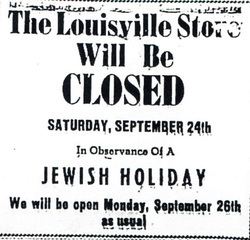 In 1949, the local newspaper reported that “a number of local businesses, including a department store, jewelers’ and women’s wear and shoe stores, were closed Saturday until sundown while their owners and operators and other members of the Danville Jewish community observed Rosh Hashana.” While Danville’s Jewish merchants closed for the High Holidays, they generally kept their stores open on Saturdays. The congregation met only once a month, on Friday nights when the student rabbi was in Danville. Martin Ryback, their student rabbi in 1946 reported that about 35 people came to these Friday night services. There were twelve children in a religious school which Ryback supervised. For a time, Jane Scherago from Lexington's Adath Israel congregation would drive to Danville each Sunday to teach the religious school. By 1948, eight Jewish families lived in Danville while a few society members lived in nearby towns like Harrodsburg and Stanford. Most all of the members were merchants, though there were two members who were doctors at the state hospital in Danville. The religious school had shrunk to only four students by 1948, though it met each Saturday. Hoping to improve the quality of their small religious school, the members of the Blue Grass Judean Society increased the frequency of their student rabbi visits to twice a month starting in the fall of 1949. In addition, Rabbi Sidney Ballon of Adath Israel in Lexington came down to Danville occasionally to serve the congregation, which consisted of about fifty people at the time. Despite this increased activity, the congregation was shrinking, and in 1950 the members decided to discontinue bringing in student rabbis due to limited funds and declining attendance and membership. By this time, the Blue Grass Judean Society had lost much of its energy, and the group dissolved in the early 1950s. The few remaining Jews in Danville then traveled to Lexington for services and religious school. The Blue Grass Judean Society never had a permanent building nor a cemetery and was never even listed in the Danville City Directory. Even though they no longer had a congregation of their own, Danville Jews remained a vital part of the local economy. They continued to own several retail stores downtown. In 1960, Harold Baer owned Jacob Baer, Inc., a clothing store, while Ben Baer managed the Louisville Store. Walter Frankel and his nephew Joe Frankel, Jr. ran the Hub-Frankel Department Store, while Edna Frankel co-owned a candy shop. Raymond Miller still owned the Cinderella Shop, while new stores included Robert Cohen’s Leonard Jewelers and Jan Shoes, owned by Myron Zuckerman. But over time, most of these businesses closed due to increased competition from chain discount stores and the fact that many of the owners’ children moved away to larger cities in search of greater social and professional opportunities. Raymond Miller closed the Cinderella Shop in 1981, while the Louisville Store, still owned by the Shapira family, closed in the early 1990s. In 1996, Joe Frankel Jr. finally decided to close the Hub Department Store, ending its 90-year tenure in Danville. The demise of the city’s Jewish-owned retail stores did not mark the end of a Jewish presence in Danville. Centre College has attracted a handful of Jewish faculty and students in recent decades. Beth Glazier-McDonald came to Centre in 1988 as a professor of religion. In 2011, she became the associate dean of the college. Centre had 13 Jewish students in 2012, and the college’s first Jewish student organization was founded in 2010. Joe Frankel Jr. spent many years on the board of Centre College. In addition to those affiliated with the college, a few Jews work as doctors at the local medical center. In 2012, about ten to 15 Jews lived full-time in Danville. Those who wish to be a part of an organized Jewish community drive the 35 miles north to Lexington.